Robust design with unique full moisture control system. • Salt-resistant rubber seal prevents contents from getting wet and thus hardening. • In-built measurement gauge, in litres and kilograms, quickly and easily identifies volume of salt/grit in bin and how much is required to fill up. • Discreet finger grips for effortless lifting when empty. • Reinforced forklift recessess enable easy relocation. • Secure contents by padlock through central latch or, for extra security, through latch and clasps (padlock sold separately). • Pack of 8 optional reflective decals ensure visibility in busy car parks, especially in low light conditions. • Manufactured from medium density polyethylene, bin measures: 666 x 1000 x 750mm (H x W x D). 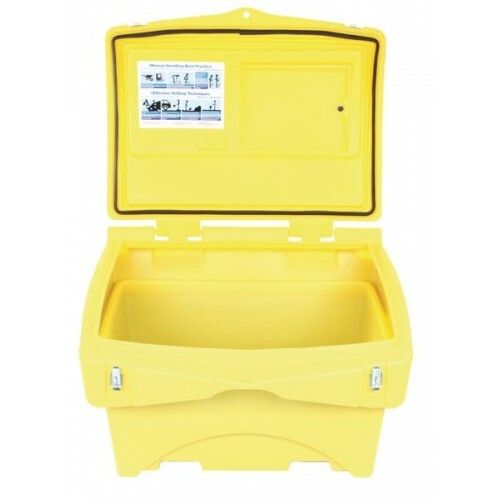 • Weighs 20kg when empty and has 220 litre capacity.